On 13 December, the Greek government inaugurated 3 local health units in the wider urban area of Thessaloniki, with the aim of reducing inequalities and barriers to accessing quality health services. The health units, established in the Ambelokipi, Evosmos and Pavlos Melas areas, are the first of their kind in the country. They are part of the government’s broader efforts towards establishing modern, people-centred primary health care services in Greece. The units, called Topikes Monades Ygias (TOMY) in Greek, are key elements of the newly designed primary health care system and will serve as the first point of contact and the main coordinator of care for people in the area. Here, multidisciplinary teams (general practitioners/family doctors, paediatricians, nurses, health visitors and social workers) will provide health care for people in a continuous manner, looking at disease prevention, health promotion, diagnosis, treatment, monitoring and care. The new units will also have clear referral mechanisms. This is a major change from the otherwise fragmented network of different public and private health providers, primarily specialists, providing care upon request and with little coordination. The opening events in the 3 areas were attended by Prime Minister Alexis Tsipras, the leadership of the Greek Ministry of Health, representatives of the local authorities, community leaders, health and social workers and representatives of WHO/Europe. “This is a reform that aims to shift the focus from treatment to prevention. It is an evidence-based response to the health systems crisis and to societal demand for the elimination of health inequalities,” stated Minister of Health Andreas Xanthos in his speech at the opening of the health unit in the Evosmos area. 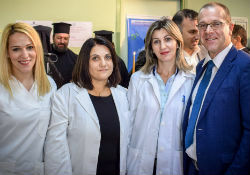 Dr Hans Kluge, Director of the Division of Health Systems and Public Health at WHO/Europe, congratulated the Greek authorities and the communities on this important event. He said, “Today’s event demonstrates that real fundamental health reforms are possible in Greece and they are happening now, not in the far future”. A strong primary health care system is essential to move towards universal health coverage (UHC). The opening of the units coincides with events around the world that highlight the growing global momentum on UHC, starting with UHC day on 12 December and the global UHC Forum 2017 in Tokyo, Japan on 12–14 December. a new law on primary health care passed by the Greek Parliament in August 2017. Other recent actions include piloting of integrated health and social services in Ioannina – the first such exercise in Greece – as well as addressing informal payments in the health sector and the launch of a nation-wide communication campaign to support the reform process. These activities are part of the Strengthening Capacity for Universal Coverage, Phase 2 (SCUC2) action, funded by the European Union, to contribute to improving health and health equity in Greece, especially among the most vulnerable in the crisis-stricken population.